When you think about the color pink, do you think of little kids in tutus, or refined pink home decor? It’s more likely that most will think of the former. Barbies, playrooms, fashion runways, and lipstick have taken over pink and given many the idea that it can’t be used for anything except frilly, super feminine, and child-centered purposes. Pink is a more versatile color than most people give it credit for. 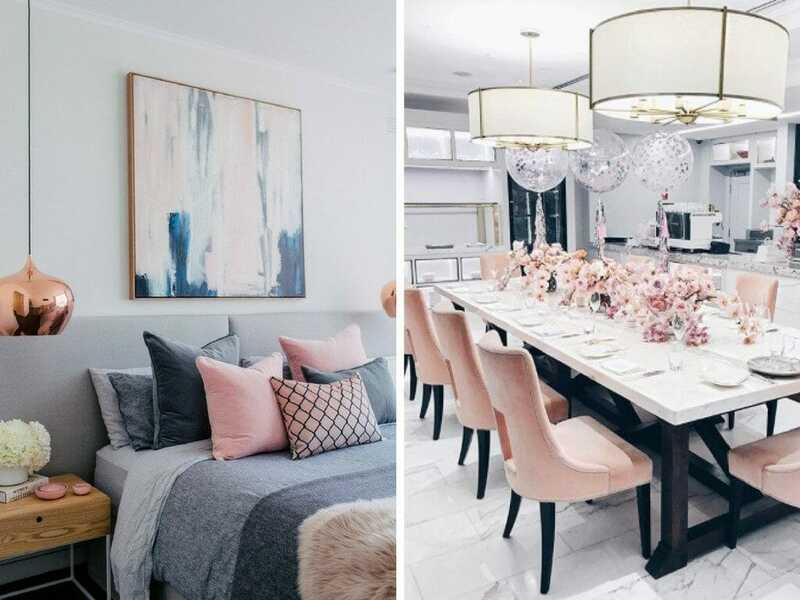 Using pink home decor doesn’t automatically define a space as “girly.” Depending on how you stage it, your home can successfully and effortlessly display unique pink decor. 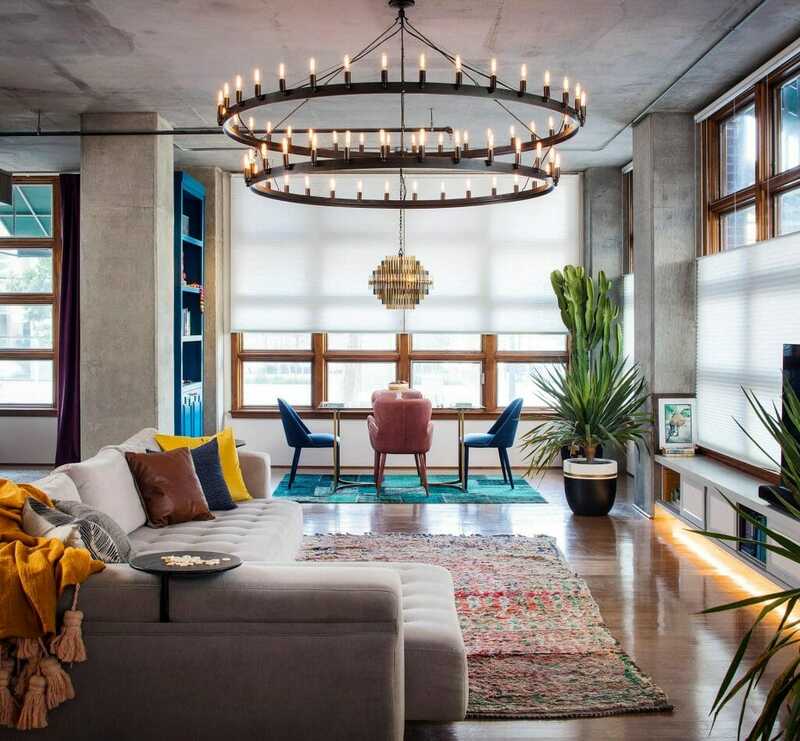 If bright colors in general are your design style, our Spring Inspired Interior Design Trends post will give you even more inspiration. Continue reading for the top 7 ways to incorporate pink into your home decor. 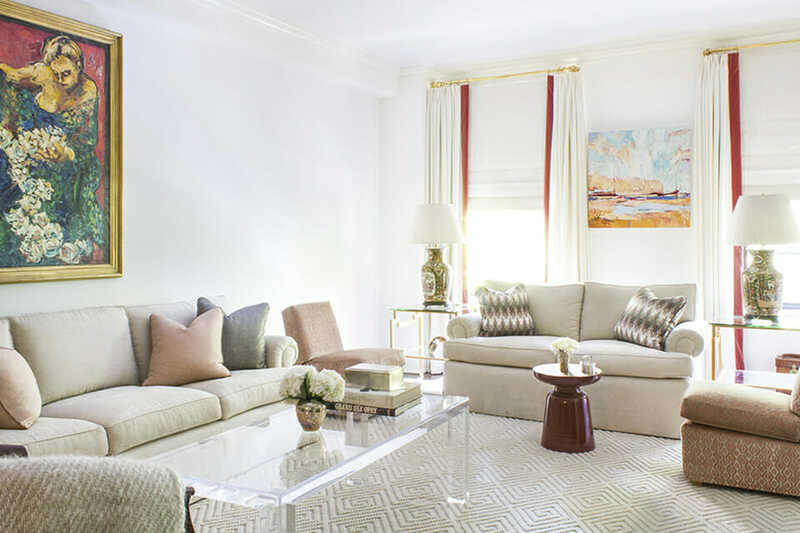 Design by Decorilla online interior designer, Corine M.
Any color can stand alone as a statement piece, and a bold pink home decor item in your house is no different. Take a pink sofa, for instance. A sofa is the main focus in a living space because of its size and because it is usually one of the most used pieces therein. Just like it’s neutral sofa counterparts, a pink sofa can be styled in any way you want it. Modern, minimalist, tropical, boho, glamorous, vintage, eclectic – the options are limitless. 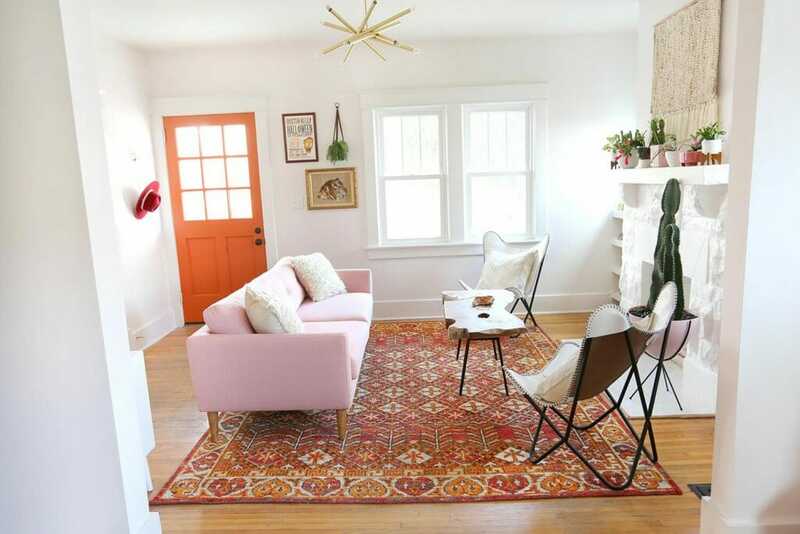 By Decorilla Designer, Foster C.
Accessorize your spaces with touches of pink decor. A throw pillow here, a throw blanket there. You can even add pink dining chairs to ensure the color doesn’t go unnoticed. These pink home decor accessories are the perfect inspiration for your home decor designs. Artwork is also a fabulous way to introduce several different pink elements into your home. Artwork with pink in them can often serve as inspiration, too. Use the other colors in the painting, such as the blue in the one above, to help coordinate more colorful accents in your home. Pink isn’t always a dramatic burst of color. Different tones of pink make it more muted and subdued, and thus easier to add more than one pink item in a room. Choose any surface and make it pop with pink. If you want to include pink on your dining table, add pink vases, chargers, napkins, and floral arrangements. Coordinating throw pillows in several tones of pink and complementary tones of blue creates balance and harmony within a space, too. Design by Decorilla online interior designer, Tina G.
If you want more pink home decor, why not make everything pink? Using different pink elements throughout the entire room will make the pink less surprising. Well, it will still be a bit of a shock to, but it can help normalize the pink within your space if everything is just pink! You can’t deny how gorgeous this pink on pink on pink room is, though. None of the pinks are exactly the same, but all of the pink tones complement each other well. 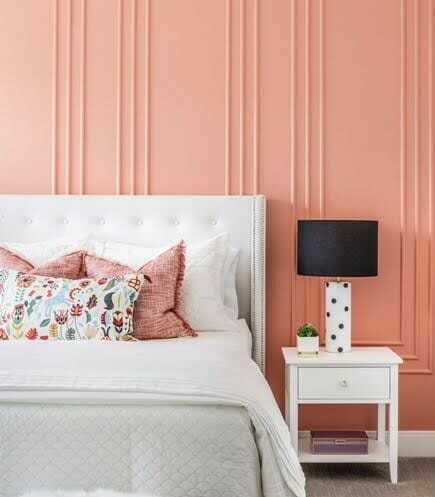 Pink walls are also another way to add the color everywhere. You can coordinate pink home decor with it amongst a more neutral palette, such as Decorilla designer Tina G. did. The pink walls are coordinated with white bedroom decor and pink accessories. Pairing pink elements with dramatically dark colors creates a calming balance and also lets your link home decor be the focal point in the room. Combine dark walls with a pink sofa or pink lounge chairs. 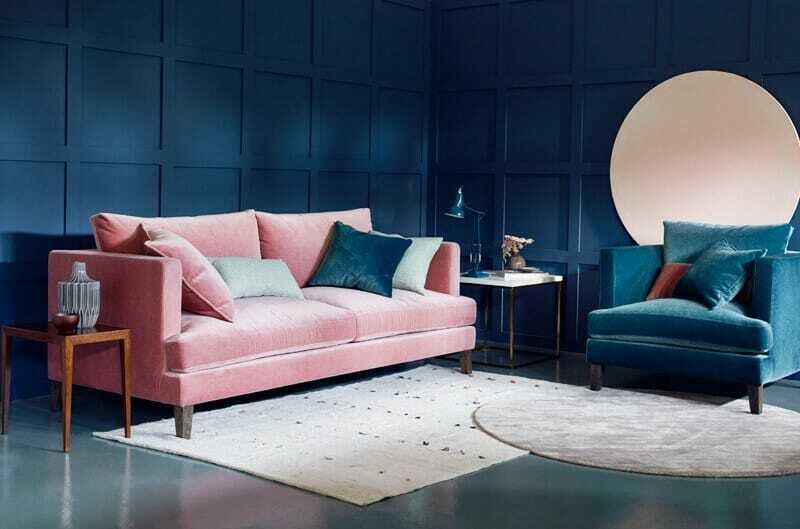 For a more traditional look, a navy colored sofa surround by pink home decor such as throw pillows and artwork allow pink to play a secondary role in the design scheme. Dark green tropical aesthetics paired with a few bright decor elements are very popular right now. 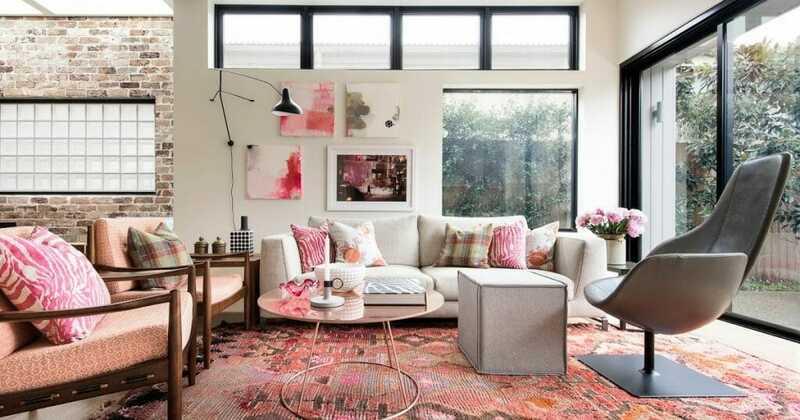 Pink and green together are especially trendy, and they make a very mature pairing that reflects boho tropical design. 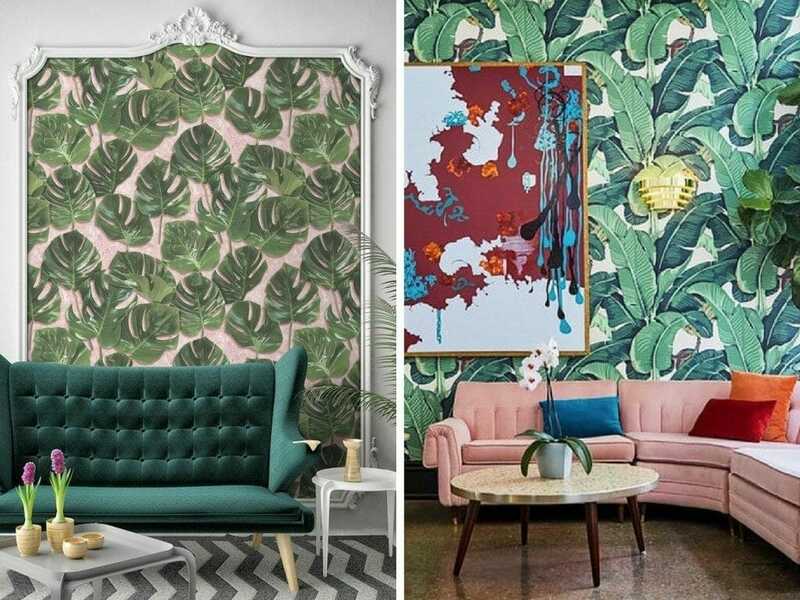 Dark green leaves enveloped by a pink background stand out in an otherwise neutral space, giving it a gorgeous point of interest with being overwhelming or obnoxious. For a more flashy design, tropical wallpaper accented by a bright pink couch and several other vibrant colors. Nothing says welcome quite like a bright pink door. It will be the talk of a neighborhood and everyone who visits will inquire about it. Those who enter will know that more great design lies on the other side of the door, and those who only pass by will imagine the same. A pink front door sets the tone for everything else in the home. It could be the only major pink design in your home, or you can tie in several pink elements with it throughout the house. A pink door inside of the home is also a great focal piece. All other elements around it can be simple so that they complement it instead of competing with it. A pink door can actually make the rest of your design decisions really easy. 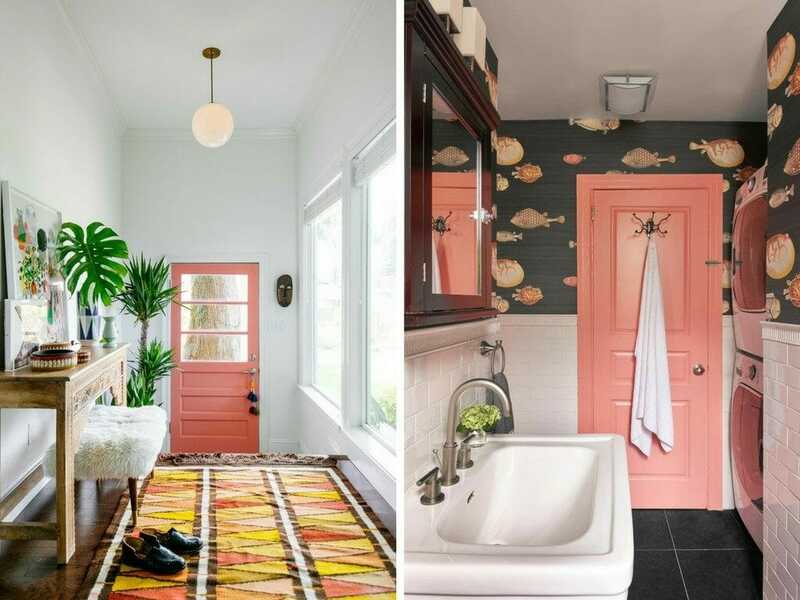 A pink bathroom door surrounded white wall tiles, and dark floor tiles and dark wall paper with pink sea life on it allows the door to stand out, but also draws your eyes to the subtle details of the room above. Whether you want a very feminine space or a neutral space, it can all be accomplished by using pink home decor throughout your home. How you decide to incorporate those pink elements is up to you. 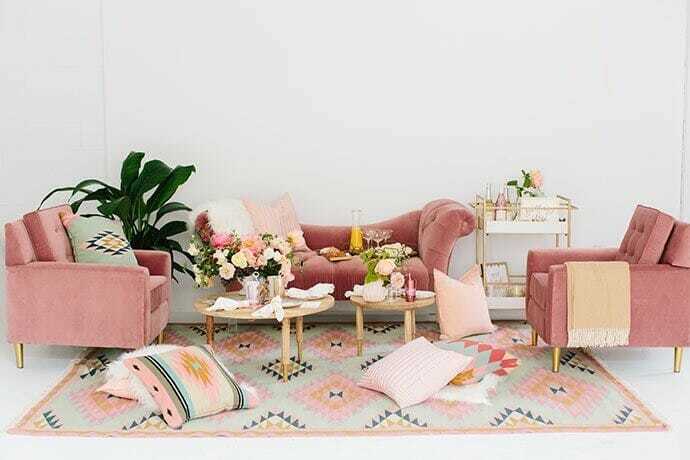 A bright pink door or a dark toned pink couch with bright pink throws on a neutral couch, or any pink home decor elements in between – there are several ways to bring lovely pink colors into your home. Do you still need more direction on making pink decor part of your home’s design? Schedule your free interior design consultation with a Decorilla designer today! Written by Decorilla interior designer, Addie F.